Yesterday, I was having a debate with a few people about the concept of morality. It’s amazing how a debate about politics can quickly descend into ad hominem attacks and sny, subtle insults, but philosophy and moralty can be discussed with a rational calmness that I find enlightening. “Why so serious?” Mossy replied back. I turned down his offer to discuss it on the debate lounge for the time being. But I gave the manner some thought throughout the night and in the morning. Moral nihilism is difficult to discern. A kind of catch-22 of reason that is tricky to define or at least prove. Why is nihilism so tricky? When you deny the concept of morality in general, there is still a cold assertion of logic that can serve as a basis of morality. Mossy Toe’s view was built around the biological juxtaposition of humans as animals, which is true. He cited a few examples of moral absolutism being undone by circumstances which challenge such values and find its believers wanting, such as a starving civilization finding the sacrifice of its children as noble, or even a moral duty. You may live in the jungle and adhere to no “delusions of morality” as Ian Holm‘s character put it in the movie Alien. But that still creates a fundamental paradox, an acceptance of the survival of the fittest. Hence you have that ah ha moment, where in denying morality, you inherently accept a much simpler code of it instead. As I considered that, I found myself thinking about the man who has been on everyone’s mind since 2008. 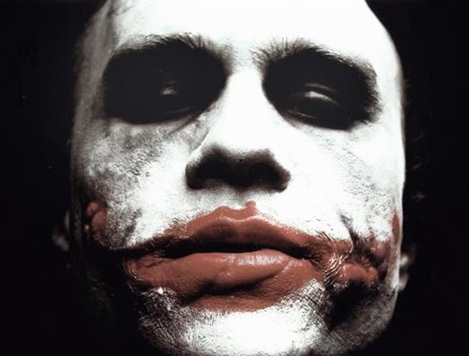 Heath Ledger‘s version of the Joker was a triumph of moral nihilistic thinking, at least in his ability to challenge everyone else’s moral standings. That was his raison d’être. For anyone who has seen the film, which drew inspiration from Alan Moore’s The Killing Joke, the Joker’s real goal was to render away everyone’s morality. His approach was simply to create the extreme circumstances of which test our sense of what is right or wrong. Kill this man or he’ll blow up a hospital. Blow up the other boat and he’ll let you live. Take off your mask or he’ll kill someone. Perhaps the Joker did bow to the “survival of the fittest” concept, but his application of nihilism was to scrub away the veneer of morality that people apply to maintain some order in their lives. Moral relativists can be harder to break for that reason: They would often have an easier time accepting that the circumstances were dire and justify normally abhorrent actions. What works, works, as pragmatists would say. But sooner or later, they will get backed into a corner where they find, at the base of the flexible set of acceptable standards, a morally absolute bedrock that they will not cross. The line in the sand. I would imagine that most, though not all, moral absolutists are like eggs. They might have some loftier views of ethics, but in the face of a moral test, they crack quickly. And are left with a hypocrite’s shame of being unable to live up to their own expectations. But then there are those moral absolutists who hold on. Batman, with the exception of when he almost turned himself in, could be described as morally absolute. The kind of grounds we usually think of when we devise heroes and protagonists. We often mock people who publically declare their values, because we’re so used to being let down. It takes action, not words, to define one’s position. Conviction must be proven. I’ve often found that people tend to have the highest respect for moral absolutism whenever we can legitimately hold onto it. When we don’t bow to the pressure compromise with our integrity. And that, of course, is the hard part.